Vintage Treasures was the dream of Carole Smith. 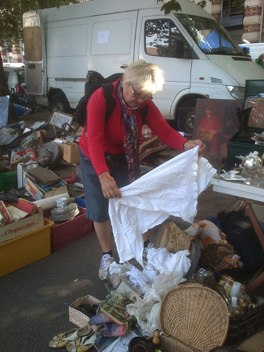 Based at the Vintage Shop in Hinckley, Leicestershire she has been selling at antique fairs for over 25 years. Carole specialises in homewares, textiles, kitchenalia etc together with many pieces of furniture that she restores herself. She has City & Guilds qualifications in upholstery and is much influenced by the shabby chic look. We can also be found at Leicester Antiques Warehouse and at antiques and vintage fairs selling a great mixture of retro household items, fashion accessories, vintage clothes, fabrics, small furniture etc. Our stock is mostly pre 1960 but some date from as early as the 19th century. Our 'Where do we sell?' page shows our fairs diary and details of the Leicester Antiques Warehouse.